The article is devoted to the history of the national concept of the head of state institute in Spain. The most significant works of Spanish researches of constitutional law and its history were analysis on the base of a historical approach in chronological order. The author shows the evolution of the institute of the head of state in its intertwining with its constitutional affirmation, influence of these processes over scientific research. 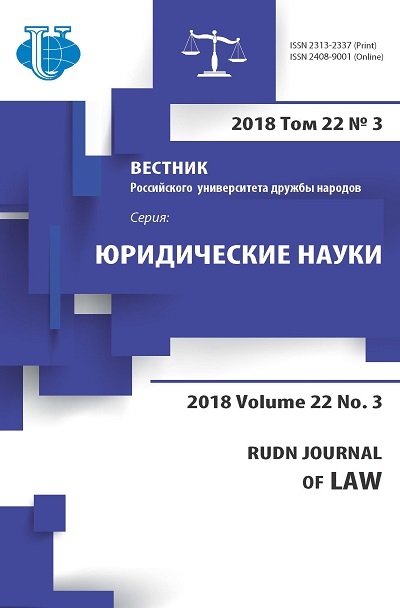 At the same time, their predetermination is revealed by the political history of the country, in the context of which it seems useful to carry out juridical research in general and historical research of constitutional institutes in particular. The author of the article distinguishes the following periods in the scientific research of the development of the national institute of the head of state in Spain: 1) status of the king as the supreme executive body (I-III quarters of the 19th century); 2) king as the head of the state occupying the supreme position in the system of state power (the last quarter of 19 - the first third of the 20th centuries); 3) legal status of the president - the head of state in the II Republic (1931-1939); 4) institute of the head of state during the regime of personal power of the caudillo F. Franco (1939-1975); 5) institution of the head of state in the modern Spanish kingdom (1975-present). The article shows that the impulse for research of the head of state institute in Spain was given not only by the political and legal reality, but also by legal education. Therefore, educational literature has taken an important place in the Spanish historiography on the subject; it always had a high scientific level. Research of the history of the institute was mainly focused in the title of academic courses: public constitutional, public, political, administrative, constitutional law. The author concludes that there are spheres to be researched concerning the head of state institute: its concept, evolution in the Spanish constitutionalism, elements of the institute and its variants, links with related concepts. institute, head of state, constitutional law, king, crown, political law, president, status, jurisprudence. Copyright (c) 2017 Alexeeva T.A.